Men work on the Panama Canal locks near Panama City, on Feb. 21. An acrimonious financial dispute has slowed work on an expansion of the 100-year-old canal that will accommodate larger ships. The work is now expected to be completed next year. When the United States built the Panama Canal a century ago, it faced harrowing obstacles, from mudslides to malaria that killed thousands. But history doesn't appear to show a financial dispute with contractors. At least not one that halted labor on the maritime marvel. Fast forward a century, to a $5.3 billion expansion on both the Pacific and Atlantic ends of the isthmus waterway. It looks like a digitally created Hollywood epic, an army of trucks and cranes erecting concrete walls more than two miles long and more than 100 feet high. The wider, deeper channels and locks are aimed at serving more massive vessels known as Post-Panamax ships. Over the next decade they should almost double the cargo the canal moves in and out of our hemisphere. As a result, says Jorge Quijano, who heads the Panama Canal Authority, or ACP, "Panama is essentially going to be the largest port in Latin America." Yet earlier this year the expansion work stopped for two weeks. The reason: a disagreement between the Panama Canal Authority and a consortium of European construction firms, the GUPC, over who should pay for a $1.6 billion cost overrun. They've since agreed on some stopgap financing to keep the project running – the entire canal expansion is about 75 percent complete, and is slated to be finished by the end of next year – and they've agreed to international arbitration, some of which is now playing out in Miami. But until the two sides get this settled, a cloud of uncertainty hangs over the project's final stretch. And over many U.S. ports which have laid big bets on the Panama venture by investing billions in their own expansions in order to profit from the increased Post-Panamax traffic. Miami's expanded port, for example, just opened a new, billion-dollar tunnel – the jewel of a $2 billion makeover that includes a major dredging project and skyscraper-size loading cranes for sending a lot more auto parts to Brazil and getting a lot more handbags from China. Says Carlos Urriola, executive vice president of the Manzanillo International Terminal, a major port at the Panama Canal's Caribbean entrance: "We're all too aware that ports like Miami are definitely waiting to see when we're going to be ready with our canal." Odds are that arbitration will cut through the dysfunction and that the canal expansion will be ready on time. No project of this magnitude is ever immune to snags; but given the hemispheric if not global importance involved in this one, the alleged $1.6 billion spillover is alarming. It represents a full half of the GUPC's original $3.2 billion contract. So was the GUPC's bid simply too low? And if so, why was it accepted by the Panama Canal Authority, which since taking control of the canal from the U.S. in 2000 has run it in otherwise stellar fashion? I spoke in Panama with both Quijano and Jan Kop, the GUPC's deputy project director. Kop insists the consortium has run into "surprises that we could not have foreseen." He argues it has had to dramatically adjust its costs for circumstances like rare soil conditions and higher-than-expected earthquake potential along the canal. Things, Kop adds, that the Panama Canal Authority "should have known about since 1914." Quijano, a U.S.-educated engineer, calls the claims either false or exaggerated. "Even if [the GUPC's claims were] fact," Quijano says, "the [cost] amounts they are claiming are outrageous. They're not even within the ballpark." He adds: "[Their] behavior is definitely disappointing." Kop says the Panama Canal Authority is sticking "too rigidly, given the project's scale," to the contract. But shipping analysts tell me there's a broader reason for Quijano's hard line. Namely, the Panama Canal Authority's earnest desire to prove itself a reliable institution in contrast to Panama's notoriously corrupt political and judicial systems. Which means making a point of holding to business agreements too often cavalierly dismissed outside the canal's walls. 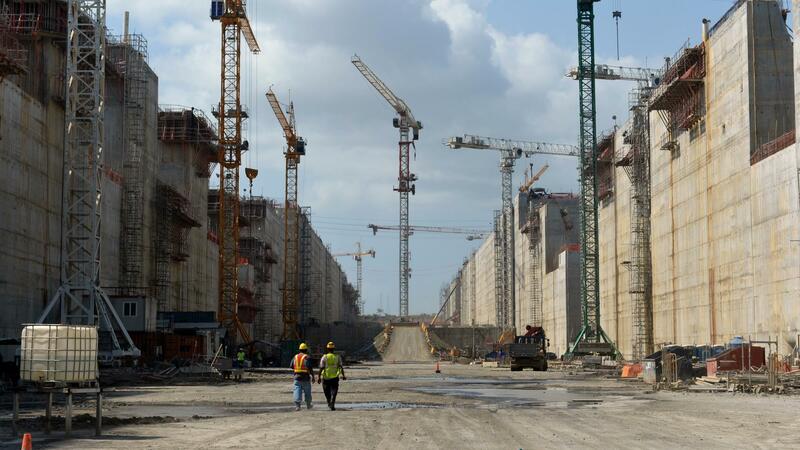 Arbitration will decide if the Panama Canal Authority is being too inflexible in this case. But making Panama more transparent is in fact key if the tiny Central American country, with just 3.5 million people, wants to realize its outsize ambitions. One is to compete with Miami to be the commercial "gateway to the Americas." The other, larger goal is to become the Hong Kong of the Americas – a global maritime and financial hub. "We're selling Panama now more than the Panama Canal," says Quijano. "We do want to take away a little bit of the business from Miami," he adds. "With an expanded canal and all the [business] diversification it envisions ... our thrust is to make Panama a [hemispheric] logistics center." As a result, says Urriola of the MIT, the canal "is the religion that unites all Panamanians." Which is why those Panamanians are praying for light at the end of the canal expansion's tunnel. Tim Padgett is based in Miami with WLRN. You can read more of his coverage here. Panama Canal was a stunning feat of engineering when it opened its locks 100 years ago. It still is, but today a massive effort to widen and deepen the maritime shortcut is underway. By allowing bigger ships, the expansion aims to nearly double the amount of cargo that moves between the Atlantic and the Pacific oceans. The project is creating a demand for larger cargo vessels, as long as four football fields. So now, several U.S. ports are expanding to accommodate them. Tim Padgett of member station WLRN takes us from Miami to Panama to look at how the canal is changing modern shipping. TIM PADGETT, BYLINE: The Port of Miami is putting the finishing touches on a new tunnel set to open this month. It's part of a $2 billion upgrade, one that will let Miami send a lot more auto-parts to Brazil and get a lot more handbags from China on more massive vessels known as Post-Panamax ships. A growing number of ports in the Eastern U.S. - Charleston, South Carolina is one of the most recent - have started renovations for the big Post-Panamax ships - deep harbor dredging and skyscraper-sized loading cranes. What they're trying to take advantage of is this - an even more gigantic venture a thousand miles to the south - the $5 billion expansion of the Panama Canal. The wider Post-Panamax channels and locks will almost double the cargo the canal moves in and out of our hemisphere each year. Jorge Quijano heads the Panama Canal Authority, or ACP. JORGE QUIJANO: Panama's going to be the largest port in Latin America. PADGETT: The canal expansion sites look like a digitally created Hollywood epic - armies of trucks and cranes erecting walls of concrete more than two miles long and more than 100 feet high. Quijano says the job should be finished by the end of next year. QUIJANO: The whole program is about 75 percent complete. PADGETT: Which is great until you consider the trouble hanging over the remaining 25 percent. You see, earlier this year the expansion work shut down for two weeks. QUIJANO: This behavior is definitely disappointing. PADGETT: Talks broke down between the Authority and a consortium of European construction firms over who should pay for an alarming $1.6 billion cost overrun. The consortium says it's had to adjust for unexpected circumstances like higher earthquake potential along the canal - things it feels the authority did not fully disclose. But Quijano calls those claims exaggerated, if not an excuse for the consortium's poor planning. QUIJANO: They claim that they have found different soil conditions and so on that have generated more cost. However, even if that was a fact, the amounts that they're claiming are outrageous and they're not within the ballpark. JAN KOP: It's such a process, you have to be flexible. PADGETT: That's Jan Kop, the consortium's deputy project director. He says it's the authority that's being unrealistic. KOP: The ACP has put in place a very rigid contract contract, but, of course, for a project this scale, ground condition is something - they come along when you execute a project. PADGETT: The two sides have since agreed to some stopgap financing to keep the project going, but their dispute hasn't been settled. To cut through the dysfunction and avoid another costly delay, the parties have agreed to international arbitration. Some of that legal proceeding is taking place in the United States, which seems fitting since the stakes are also high for so many U.S. ports. Carlos Urriola is executive vice president of the Manzanillo International Terminal, Panama's largest port. CARLOS URRIOLA: Ports like Miami are definitely waiting to see when we're going to be ready with our canal. PADGETT: If U.S. ports are waiting for the increased Panama Canal cargo traffic, the stakes are even higher for Panama. It's hoping to become the Hong Kong of the Americas, a global maritime and financial hub, says Quijano. QUIJANO: There's much more in Panama than just the canal. And our thrust has been to make Panama more of a logistics center. URRIOLA: The canal is the religion that unites Panamanians. PADGETT: Which is why Panamanians and not a few Americans are praying the work gets done. For NPR News, I'm Tim Padgett. SIMON: Tomorrow on WEEKEND EDITION, we look at how the expansion of the canal is changing life for some in Panama, but not for others. Transcript provided by NPR, Copyright NPR.